"Displaying consummate control he expertly demonstrates the range and luxuriant tone colours of the Norman and Beard organ at Wellington." "Soloist Robert Costin who studied at the Royal Academy of Music and Pembroke College, Cambridge is currently director of music at Ardingly College, West Sussex. In these scores by Liszt and Reubke, the assured Costin avoids the temptation to rush giving the music ample time to breath. Displaying consummate control he expertly demonstrates the range and luxuriant tone colours of the Norman and Beard organ at Wellington." "Robert Costin shows himself to be a player in total technical command, as well as being a searching and impressive interpreter whose registration and sense of dramatic juxtaposition in these major works reveal a very gifted musician. The recording quality is very successful indeed, and all in all this CD is most strongly recommended." and Fugues offered here highlight his significance in Classical music. In contrast Julius Reubke (1834-1858) although composing at the same time as Liszt is not at all well known given his untimely death of tuberculosis. He was a student of Liszt and was held in the highest respect by the composer. It is fitting that these two composers should be twinned together in this very unique recording. 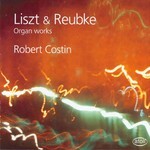 These Organ works are remarkable pieces displaying the full range of organist Robert Costin. Costin now based in England spent a good few years in New Zealand holding organists posts in both Wellington and Auckland. very fine, and extremely rare, example of an English Symphonic style organ. It has been called New Zealand's most significant and historic organ and it's power and sonority are truly remarkable. FANTASIA & FUGUE ON AD NOS, AD SALUTAREM UNDAM S 258 /4-6.